During a primary orientation meeting for the May Term Thailand Course, a question regarding the quality of Thai health care was asked. Han Kim replied, “Oh yeah, the Thai health care system is great. In fact, some people travel there for health care. Medical tourism, ever heard of it?” By many measures medical practice in Thailand is laudable. With a rich history of Thai medical care and progressive advancements, Thai health care has emerged as a leader in medicine. Medical care has deep roots in the history of Thailand. Dating back to the early 11th century, there is evidence of intentional efforts to provide healing services to the people. Tools to produce medicines and written instructions for a royal medicinal garden suggest that many empires studied and manipulated the healing properties of their natural environments (Hays, 2008). During the 14th to 18th century, health care continued to grow. Some major advancements included royal drug dispensaries, drug stores and royal documents detailing the effects and directions for using specific medicines (Hays, 2008). The study and expansion of medicine was an integral part of many historical eras in Thailand. Thailand is a small, but amazing country. There are a couple things that Thailand is well-known for. First is the fact that Thailand is the only country in Southeast Asia to never been colonized by Europeans. The people within this country take great pride in this aspect of their lives. Since this country has never been colonized, this means there is a very unique culture that you cannot experience anywhere else in the world. Over the last year the political climate in Thailand has experienced a new turn that it has not witnessed in over seventy years. On October 13th, 2016, former and beloved King Bhumibol Adulyadej also known as King Rama IX passed away. There are varying theories about when Buddhism reached Thailand. Some say that Buddhism was introduced to Thailand during Asoka’s (a great Indian leader) reign. He sent Buddhist missionaries to many parts of the world. Others believe that Buddhism was introduced much later. Based on archeological and historical evidence, Buddhism first reached Thailand when it was inhabited by a racial stock of people known as the Mon-Khmer who had their capital city situated about 50 kilometers from where Bangkok is now. In 1932, Thailand experienced a major and peaceful coup that caused a dramatic shift in its power structure, from monarchy to “a constitutional monarchy. King Prajadhipok initially accepted this charge but later surrendered his kingship to his 10 year-old nephew” (Zebioli 4). Subsequently, a world war erupts. Thais were historically described as an axis power during WW2 because in 1941 they invaded French Indochina to start the French Thai War. The Japanese served to mediate the conflict and brokered a deal a few months later which forced France to relinquish its claims on disputed territories. 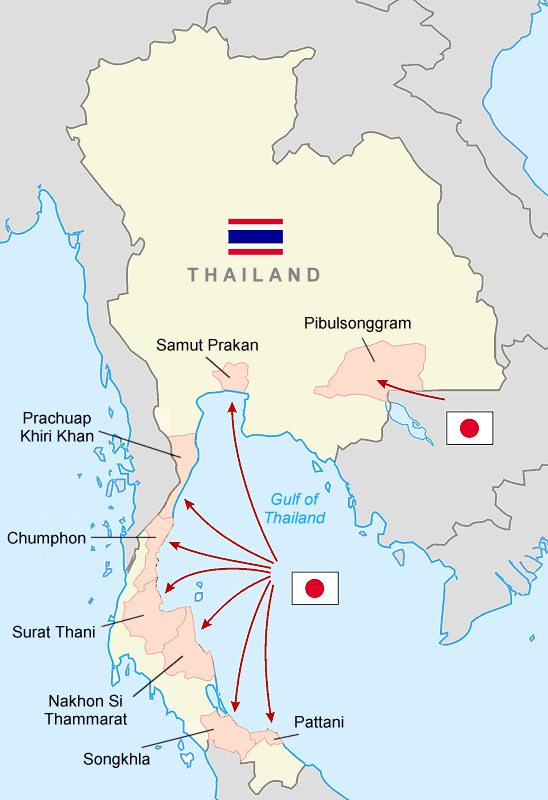 Thailand signed an agreement to support Japan provided that they return the territories lost to the British and the French. For these reasons Thailand is often branded as an axis power, although its motivations could be seen as being motivated more by anti-colonialism than aggression towards the allies.